We offer several ways to experience Ampersand. 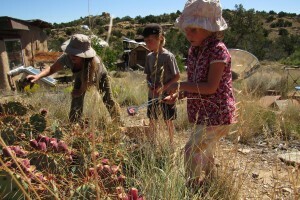 Learn more about our events, tours, retreats, residencies, workshops and volunteer positions. We are not offering our usual May- July internship program for 2017. But f you want to intern with us, we might be able to work something out. Let us know what you are looking for. We can arrange a personalized tour or workshop for your group. We have done this for community and church groups, as well as for school groups of kids or older students. 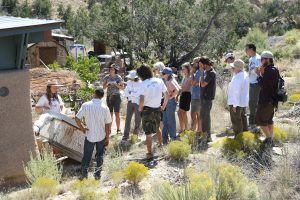 We have hosted groups from the Santa Fe Waldorf school, East Mountain High School, Americorps staff, UNM Sustainability Studies program, Ghost Ranch staff, various church groups, folks looking towards forming a co housing community, and others. We limit group tours and workshops to 20 participants. Contact us for more details. Want your own private tour of our site? We charge $35 for an hour tour. If you want to talk longer and get into more detail about some aspect of our work, or get feedback on your own project, it’s $35 each additional hour. Want to live at our site and help out with a project for a bit? Contact us at amanda@ampersandproject.org if you are interested. 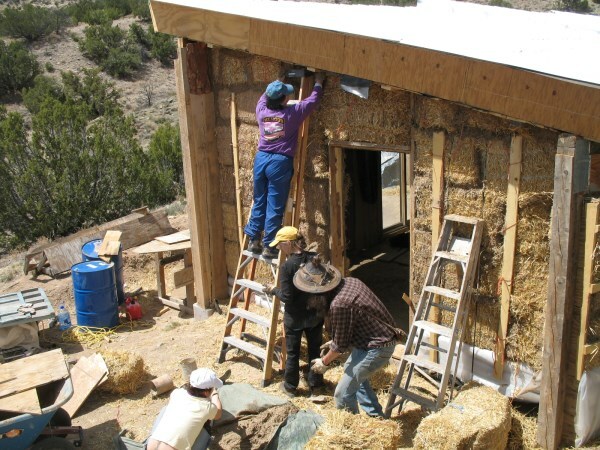 Get experience with hand crafted DIY sustainable water and solar systems and passive solar buildings made of earthen and salvaged materials. Learn about building by doing it. We will teach you how to cook with the sun. 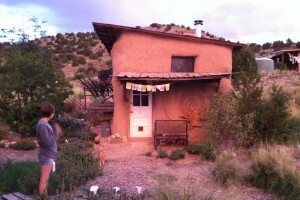 We provide housing in a yurt, tipi, or strawbale cottage. Our solar powered community outdoor kitchen is equipped with solar ovens, a propane stove and fridge, and a system for re-using greywater. Things change a bit during the colder months. We ask for only part time work. 20 hours of work per week gives you time to explore our beautiful land, peruse our extensive library, hang out in the funky village of Madrid (in walking distance), or visit different parts of New Mexico. 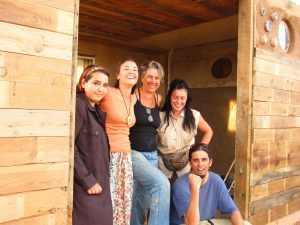 We have been teaching the essential aspects of sustainable living in this climate for over a decade and we incorporate learning opportunities into life at Ampersand based on the interests of volunteers. Bulk food items like oats, beans, rice, lentils, and olive oil are provided. We look for community-minded volunteers who can be both hard working and flexible. A sense of humor is always appreciated. Volunteers will maintain the community kitchen and may take turns with meal preparation for our small group of 5 to 7. Community meal prep time is included in work hours. We will generally work together on building projects 3 days per week, and self-directed volunteer responsibilities will be on other days as well. While we provide bulk foods as well as produce as it is available from our small garden, we ask volunteers to provide supplemental ingredients for meals and snacks. We have found that pooling funds for group shopping trips can work well. Minimum stay 2 weeks. There may be longer term volunteer positions available.